Different Types of Sump Pumps - Which is the Best? | News and Events for Basement Systems, Inc.
Home»About Us»Blog»Different Types of Sump Pumps - Which is the Best? Different Types of Sump Pumps - Which is the Best? Every basement or crawl space is at risk of flooding. With that being said, there's fortunately a simple solution. A sump pump is your best protection against flooding. A sump pump automatically moves water that collects in the sump basin located in your basement or crawl space and pumps it outside. There are two common sump pump types, and choosing the best one depends on your home's specific needs. 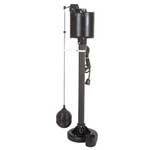 Pedestal – A pedestal type sump pump is an upright pump with an impeller at the base of a pedestal. The motor is located above the pump and is not meant to get wet. Pedestal sump pumps are typically less expensive than submersible pumps, but they also tend to be noisier and are more likely to overheat. Submersible – A submersible type sump pump is installed in a sump pit and is designed to function underwater. Submersible pumps are usually more expensive, but have a longer lifespan than pedestal sump pumps. A submersible sump pump is also quieter and is hidden inside the sump basin, providing a cleaner appearance. Tip: When choosing a sump pump, look for a model with corrosion-free housing materials, a sump cover, sump pump alarm and consider adding a battery backup sump pump. Basement Systems offers several submersible sump pumps to choose from, including emergency backup sump pumps. If you're considering installing a sump pump in your basement or crawl space, contact us to schedule a consultation and estimate with the local installer in your area.